Just regular folks. : Crappy, wilderness survival, CardiB again. A run of hard shifts is harder when my support system is also on the go. 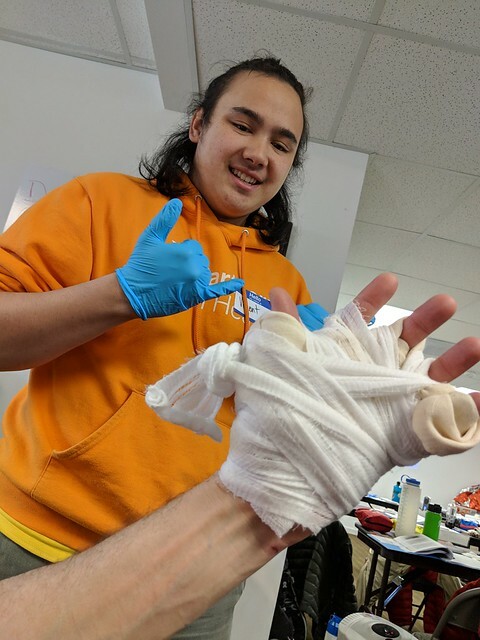 Jeremy and Vince were out all weekend doing a wilderness emergency first-aid course required for the scout trip this summer. And now Jeremy is in Florida on business. Which means that we are going to talk very little this week. Vickey, my other frequent confidant, is also traveling so it means that I'm without a good venting partner for a stretch of time here. Then I lean on Vince who tries to be supportive, though understandably not so fond, of his emotionally needy mother. So that's not great. Why do I do this to myself? I could instead go on vacation. When I have a tiring and emotional shift and want to quit, Jeremy says - ah, you love it, I can tell you love it, you are going to figure it out and do it for years. You just wait and see. Vince says - eh, just keep going. It'll be fine. 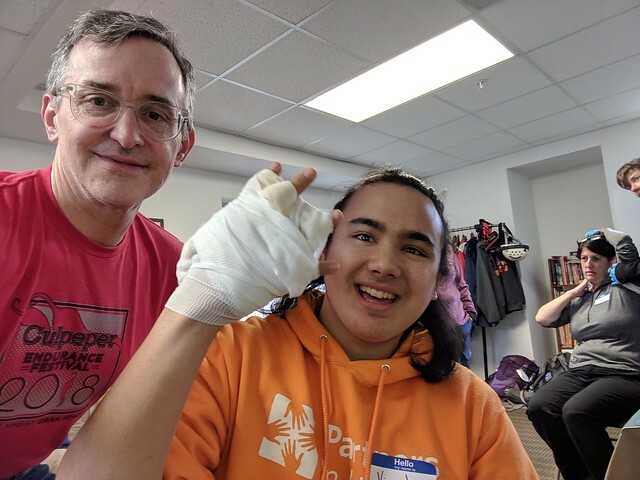 Jeremy and Vince were away all weekend (all weekend meaning 7:30 am to 9:30 pm both Sat and Sun) in Frederick for first aid training for Philmont. They need two people per group to have this training and Vince and Jeremy are doing it together. I asked if it needed to be two grown ups and Jeremy said that you just needed to be 16. From Jeremy's report, Vince has a talent for this stuff. Last year, when V was a camp counselor, a kid broke his arm while riding a mountain bike and Vince splint his arm and helped him out of the woods. 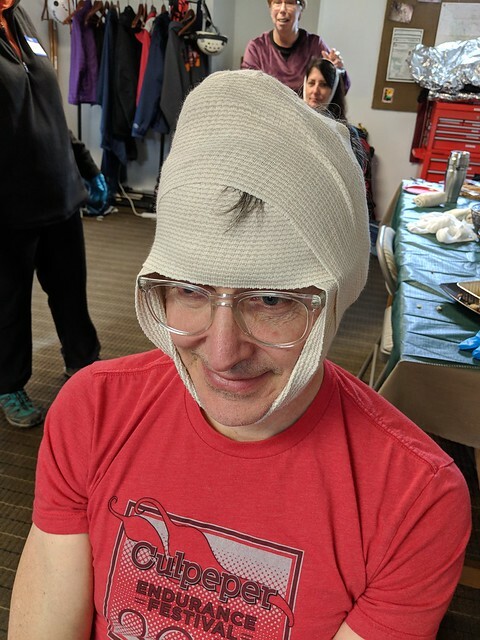 So this year, at the training, Vince took it quite seriously and performed competently enough at the practicing that when they did the final mass casualty scenario at the very end, they all voted for Vince to be the leader. Today, at school, Vince was carrying around the emergency first aid booklet at school. There are only a few life threatening things you can do things for out in the wilderness. Hmm, they are bleeding, sucking chest wound and a flail chest. All the cardiac stuff is pretty much pointless if you are out there in the woods - the instructors basically said if you can't get the person to the hospital quickly that it's just pointless to start CPR since there is such a low chance of success. Though they did point out emotionally, if a kid's dad has goes into cardiac arrest and the kid is standing there watching his father die, you do the CPR enthusiastically for thirty minutes. I asked him today if he was sure that he didn't want to be a doc (maybe an ER doc?, though I hesitate to ask because I honestly would not wish doctorhood on anyone). He said, nah, he'd be interested in being an EMT. More college talk? OK! Jeremy thought we should take Cal Poly off the list because it's the least diverse of all the public CA colleges. That there were some racial incidents that happened in the last few years (though these days I'm not sure any college campus has been free from these incidents). Vince said Vanderbilt just sounds too fancy - though I argued that Nashville sounded like a cool town. Then Vince asked about Caltech and whether it was a public school. I said it's private, but that I didn't think he should go there. Jeremy asked why and I said I generally disapproved of a school that didn't have affirmative action and besides, Caltech is just weird. We looked at Caltech's demographics - it's half Asian and probably there are more half-Asians there than there are African-Americans. Then Jeremy added - I don't think you can go there because you pretty much have to get an 800 on the math SAT to be admitted. Vince promptly replied that he was sure he could get an 800 on the SAT math which then reminded me of this recent NYT article on the differences between boys and girls in school. What about Georgia Tech or RPI, I asked? Vince didn't like Troy that much and Jeremy thought a technical school might be too limiting - not only in terms of what to study (Jeremy suspects that Vince might end up studying something other than science/engineering), but even if you were an engineer, wouldn't you want to have friends who weren't engineers? Jeremy asked. I think engineers make good friends. This is amazing Cardi B. I love you. I'm sorry someone maybe yelled at you. I think that you are such a wonderful human being Doris and would be so, so happy if you were my nurse. Even if you can't stick an Iv in so great. Ya know you can call me when you need an ear or a shoulder. I love you so much dear sweet Doris. I love all the college talk too. I really kind of failed Josh in that dept. He seemed to know what he wanted and I just kind of let him run with it. You and Jeremy have so much more experience and knowledge. Vince is really lucky to have the two of you. Now, go practice putting in an IV on Vince or an orange.